Name of the Action or Filter hook followed by the arguments available for that hook. A job well-done man. Really great plugin. But there is an issue with decimal amounts when someone puts a decimal figure like “90.87” it rounds it into “90” on the time of “Confirm Payment”. Is there something I’m doing wrong with configuration or it’s known bug? This issue has been reported a week ago, I’m sorry about that. The display value on the modal form button don’t take cents into account, but the value passed to stripe is correct. It is fixed on the develop branch of the repo at https://github.com/New0/direct-stripe/tree/develop in case you want to install that version. I’ll try my best to push the update to .org library this week. Hi, great plugin. 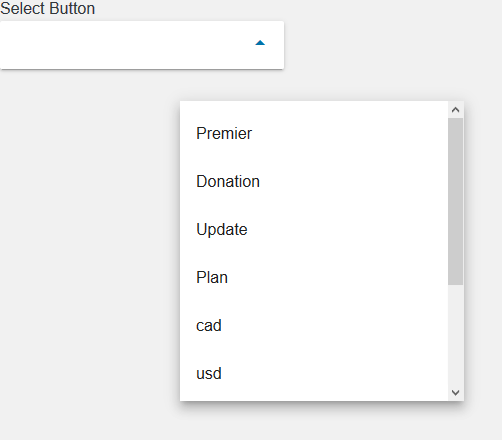 How do I insert the payment button into my WordPress page? Direct Stripe buttons can be inserted in a page or post from the editor using a Gutenberg block ( or the Direct Stripe button inserter in old editor ). In the case you want to add a button from a widgets area or a template file, you can also insert direct stripe buttons using a shortcode [direct-stripe value="ds-154185704588"] ( ds-1541857045880 being the unique ID of the button created at Direct Stripe settings under the Buttons Settings tab ). I hoe this will help ! Hi Nico, thanks for the quick reply, that worked great! Now I am not able to add a 6th button – is there a limit? Hello Pete, are you talking about total number of buttons or number of buttons in the same page ? Could you describe what happens when you can’t add a button ? When I add the 6th button and click “Create button” it says “Saved” but no new button is created. I’ve added 3 buttons to the same WP page ok. I wonder if it could be a UI issue, the select field holds six button and then you need to scroll down to see others (see picture). Could you let me know what browser are you using and the size of your screen ? Thanks Nico for your plugin! I cannot find a way to properly enable decimals, though. In Settings > Options for donations > Zero-decimal currencies, no matter how I trigger the switch, and no matter if I use a dot [.] or a comma [,] in the amount input field, decimals do not appear to work. Perhaps there is some other setting in WordPress to be enabled, please? Thank you for using Direct Stripe Kirpi. The Zero decimals currencies option concerns currencies like JPY which don’t have cents, so this option should remain disabled if you want to use donations with decimals. Could you test again ? Just wanting to check, is this plugin PHP 7 enabled? Yes Direct Stripe works on php7, I tested up to 7.2. Meaning idk about 7.3, but it should also work. Thank you for developing a good plug-in. My question is how do I incorporate a cart and checkout page onto my shop page using this plug-in. Thank for using Direct Stripe. The Direct Stripe button allows WordPress users to easily and quickly receive payments or subscriptions, it is not full e-commerce featured. It was developed with the idea that all other processes are to be managed/customized/developed separately depending on the needs. First of all you did a great job with this plugins, thank you very much !! I’ve looked for the method direct_stripe_before_success_redirection and found it in /process/ds_process_functions.php but i’m not sure it’s where your code is supposed to go. Should I just create a new php file and put your code ? i’m a bit lost in php and wordpress plugins way of working. Thank you for using Direct Stripe. The example code from https://newo.me/add-receipt_email-to-charge-via-action-hook-in-direct-stripe/ can be used in the functions.php file of your (child-)theme or as a custom plugin. I am using Easy Digital Downloads to sell ebooks. How do I direct the buyer to the ebook download page after payment? The plugin Stripe Payments has an input box for the downloadable url but yours does not. Sorry for the late reply and thank you for using Direct Stripe. Direct Stripe is totally independent from EDD but you could set a redirection to your downloads page after a successful payment. The shortcode takes the success_url argument to set use a redirection after a successfull transaction. ( I will soon update Direct Stripe in order to have a proper settings page to add and manage buttons, that will make it much easier to set ). Quick example of how to use the direct_stripe_success_user_email_content filter? What I’m trying isn’t working. Let me know if it makes sense or if you need mor details.